Apple has hitched itself to music celebrities to pitch Apple Music, the US$10/month (South Africa: R59,99/month) digital service launched a year ago. There was the very public catering to Taylor Swift. Apple broke out its chequebook for exclusive rights to albums from Frank Ocean and Chance the Rapper. Trent Reznor from Nine Inch Nails and Dr Dre are Apple executives now. Apple Music is so beyond cool it’s frozen. But to take Apple Music mainstream, Apple needs to cosy up not only to the hip musicians but also to the dull guys in suits who run the world’s mobile phone companies. They won’t get Tim Cook into hot parties, but the phone companies are crucial to Apple Music’s future. In Europe and other parts of the globe, it has become common for carriers like Vodafone in the UK or Orange in France to pair phone plans with short-term discounted or free subscriptions to Spotify, Deezer or other streaming music services. Paying a monthly subscription is still a fairly novel way to buy music, and free or low-cost trial offers through mobile phone companies have become one of the biggest ways to sell people on the benefits of membership. Such music bundles represented more than one-fifth of global music subscribers in 2015, according to music industry analyst Mark Mulligan. Apple on its own offers three months free of Apple Music, but it hasn’t really struck deals with phone carriers to promote Apple Music. Until now. Apple and BT Group’s EE, the biggest mobile phone carrier in the UK, are teaming up to give EE customers six months of Apple Music free. The deal has the potential to double the subscriber count for Apple Music if EE’s 14m 4G wireless customers are added to Apple Music’s existing 15m paying subscribers. Apple from the earliest days of the iPhone has had rocky relationships with mobile carriers. Almost on principle, Apple thought they didn’t care about consumers and Apple did. 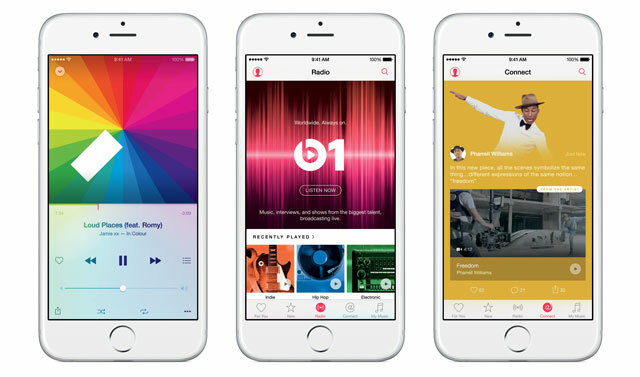 But right now, Apple really, really believes in the principle that Apple Music should be huge. Steve Jobs and Apple dismissed streaming music until the rise of companies like Spotify and Pandora proved people were happy to listen to music online without paying for iTunes downloads. Apple wants Apple Music to succeed to continue the company’s heritage on the music vanguard and to keep people buying iPhones. The company should strike even more EE-like deals with its friends/antagonists in the mobile phone business to ensure Apple Music catches on. There are always perils of leaning too hard on phone companies to market an app or digital feature. People who receive a free service might not want it or be unwilling to pay for it. Or the phone company will lose interest in the promotions and stop pushing them aggressively. The symbol for this danger is French music subscription service Deezer, which was seriously wounded by a partnership with Orange it used to increase subscribers quickly. When Deezer was trying to go public last year, the company disclosed that 53% of its 6,3m subscribers were “inactive bundle subscribers” — meaning they had received the service as part of their mobile phone plans but hadn’t actually used it. Those 3,3m zombie subscribers generated some revenue from Orange’s undisclosed fee to Deezer. But they weren’t paying full price for their subscriptions and they weren’t likely to keep paying their monthly bills for long. Deezer’s experience shows that it isn’t difficult to get people to try streaming music subscriptions. The key is doing the right things to make them stick around once their monthly cost goes from zero to $10/month. The payoff can be huge. A person familiar with Spotify’s business said it was putting a lot of effort into teaching new subscribers how to use the service and had converted more than 70% of people on telecoms offers to paid subscriptions. Apple could avoid Deezer’s zombie problem, but it needs to coddle new subscribers more than it does now. When Shira received a free three-month subscription to Apple Music last year, she received only two e-mails from Apple — one welcoming her as a new subscriber and another three months later asking her to set her iPhone to automatically charge her credit card once the free subscription ended. She didn’t. Apple Music needs chromecast support before I’ll touch it for now Deezer is what I’m using. Deezer’s “Zombie” problem isn’t a real problem for now. Deezer’s costs are linked to the songs streamed (something like $0.000001 per stream), so paid subscribers (even at a discount) that don’t stream are revenue with very minimal cost. The real problem for Deezer would be if those Orange discounted subscribers all streamed non-stop 24 hours a day. Edit: Zombie subscribers are an issue only when those discount subscriptions lapse.